Enjoy the amazing natural scenery and learn more about the ancient lifestyle outside Shanghai! Register to come to Zhujiajiao, the ancient water town, on June 30 with Mandarin House. Teachers will tell you everything about history and actual life. Zhujiajiao is an ancient water town in the western side of Shanghai. 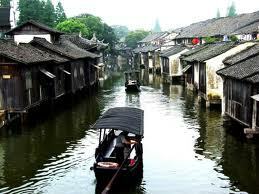 Chinese traditional water towns are notorious for their very old houses lined up along canals and the bridges criss-crossing them. Water towns sprung up along the many waterways as these have always been historically important means of communication and supplies distribution. Zhujiajiao is about 1,700 years old. Here, residents strive to maintain their traditional customes and heritage.